Make yourself at home in Coastal South Carolina. Nestled between Charleston and Myrtle Beach lies a gem of a place—the Waccamaw Neck, which includes Georgetown, Pawleys Island, and Litchfield. 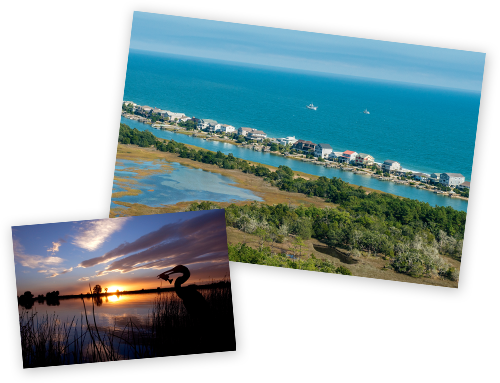 Wide beaches, sparkling rivers, ancient oaks, premier golf courses, and a rich history make this area ideal for raising a family, for a fulfilling retirement, and for those seeking vacation homes. Just a short drive north lies Murrells Inlet, Surfside, Myrtle Beach and Conway, offering all the fun and beauty of the Lowcountry. Come visit if you haven’t already, and you’ll see what we mean: We think you’ll want to stay. When you’re ready, we’ll be ready for you. The Lachicotte Company has been in the business of finding folks their ideal home since 1991. We also handle vacation rentals, long-term rentals, and commercial property sales. For now, we want to do all we can to keep you connected, so you’ll be ready when your time comes. Sign up for our e-newsletter to stay updated on homes and news in the area. Come home to Coastal South Carolina. © 2019 Coastal Carolinas Association of REALTORS® MLS. All rights reserved. IDX information is provided exclusively for consumers' personal, non-commercial use and may not be used for any purpose other than to identify prospective properties consumers may be interested in purchasing. Information is deemed reliable but is not guaranteed accurate by the MLS or The Lachicotte Company. Data last updated: 2019-04-25T13:20:36.62.